Smart money has been funneling billions of dollars into commercial mortgage backed loans. Investors seeking high dividend yields who are concerned about risks associated with residential mREITs that own pools of fixed rate mortgages have some attractive alternatives. The vast majority of commercial real estate loans are variable rate -- often LIBOR based floating rate loans. In contrast to a fixed rate mortgage portfolio, in a rising interest rate environment, these loans do not decrease in value. In fact, they potentially can become even more profitable. Private equity firms Starwood Capital Group and The Blackstone Group L.P. (NYSE:BX) are two of the largest players in the world when it comes to owning and operating investment quality commercial real estate. Historically, commercial banks have provided construction loans and interim project financing for this class of real estate. However, since the Great Recession, a host of new banking regulations has made real estate lending much less attractive for large U.S. banks. This has created an opportunity for private equity giants to sponsor sophisticated non-bank commercial mortgage lenders such as Starwood Property Trust (NYSE:STWD) and Blackstone Mortgage Trust (NYSE:BXMT) to profitably fill the void. The companies in this sector are structured as REITs, so long-term investors can count on at least 90% of taxable income to be passed through as dividends. Blackstone Mortgage Trust, with a current market cap of ~$1.4 billion, has chosen a very straight-forward and easy to understand strategy. The vast majority of its commercial loans are senior mortgage notes. They borrow at lower rates and lend out at higher rates. They underwrite each deal so the loan to value, or LTV, gives them a cushion in the case of adverse changes with either the asset or the borrower. This is similar in many ways to how a bank would operate. 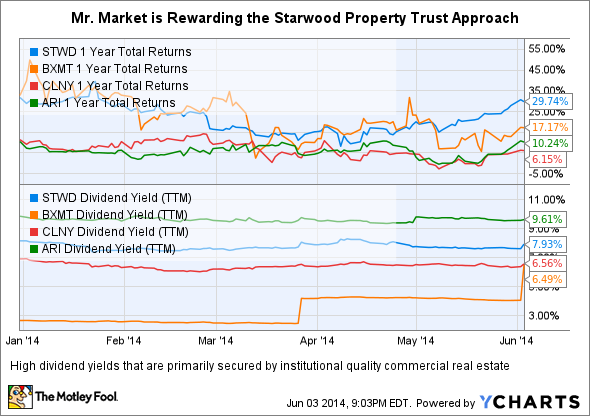 At the end of 2009, the year of the Starwood Property Trust IPO, approximately $105 million of loans were on the books. Fast forward to calendar year 2013, and ~$2.6 billion of loans were originated. During the most recent earnings call for the quarter ended March 2014, $5.4 billion market cap Starwood Property Trust announced $1.7 billion in loan originations for just the first quarter. Certainly subordinated or junior loans, and mezzanine loans are potentially riskier than senior mortgage debt. In January 2013, Starwood Property Trust paid $856 million for most of LNR Property LLC business including its U.S. special servicing unit and 50% of LNR's stake in Auction.com; along with Starwood Capital Group purchasing the other 50% of LNR's stake in Auction.com and LNR's real estate development arm for $197 million. The LNR special services group is the largest manager of U.S. troubled, or non-performing commercial real estate loans. The LNR acquisition was a source of fee income, mortgage originations, a treasure trove of information on commercial real estate markets, as well as ownership of Hatfield Phillips a servicer of European commercial loan portfolios. The synergies from having Starwood Capital as a sponsor and advisor have resulted in Starwood Properties Trust becoming the largest commercial mREIT in the U.S. as well as the largest servicer of troubled commercial loans and REO properties. This growth, combined with an almost 8% dividend is very attractive, although it does flow from a complex business model. Blackstone Mortgage Trust has The Blackstone Group L.P. -- one of the world's largest investment and asset management firms -- as sponsor and advisor. It has a much simpler business model for investors to understand, is also growing at a fast rate, and pays a competitive dividend. Dividend investors searching for total returns that are not threatened by rising interest rates should take a closer look at this sector.